100-percent EVA shower to add some fun to your college decor! Dorm Co. Tip: Replace an old, dirty, or just bland shower curtain! There’s nothing quite like the peace and quiet as being surrounded by a forest of birch trees. 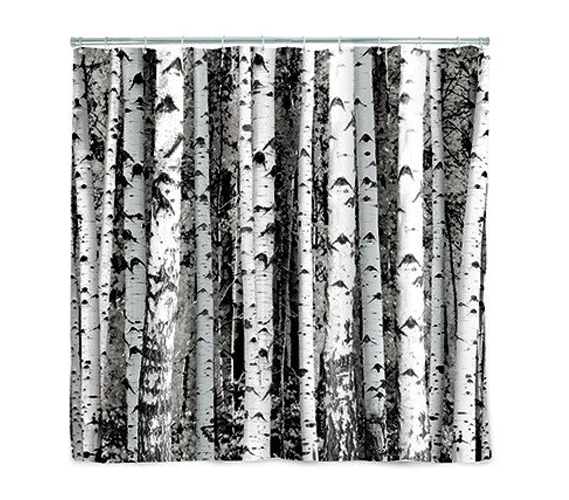 Bring that same serenity into the quiet place in your dorm, your college shower, with our Birch Wood Shower Curtain. Measuring 72” x 72”, our gorgeous birch dorm shower curtain will take you away from the stress of college life and remind you of the peaceful nature of the forest for a calming, centered start to your morning. Made with 100% EVA plastic, our dorm shower curtain is good for the environment (not made with chlorine which can give off gas when heated) and easy to clean for a hygienic and enviro-friendly college bathroom shower curtain. Keep things fresh in your dorm bathroom and have your favorite natural scene start off your day, every day, with our Birch Wood Shower Curtain for your college dorm bathroom.